If your dog has fluffy or floppy ears they are more likely to get dirty on the inside and need a clean. You can learn how to clean dog ears at home and avoid a costly regular trip to the veterinarian. Some dog parents even get their dogs sedated at the vet to have their ears cleaned. This is extreme and is usually not necessary. See all the tips and tricks you need right here to do the job at home. Dog’s ears are extremely prone to having dirt, debris, germs, and infections in them. The more you clean your dog’s ears, the less likely they’ll be to have infections and other issues. If you’ve never done it yourself it can be a bit tricky at first. However, once you learn the correct technique, it’s not too hard to do it yourself instead of going to a vet or groomer regularly. Should I Clean My Dog’s Ears at Home? Dog Ear Wipes can be used instead of cotton balls. CLICK HERE to see the price on these wipes. First, you require very few tools. As long as you have cotton balls/wipes, gloves, ear cleaner and some treats for your dog you are set. Second, it can be a bonding experience for you and your dog. The time you spend cleaning your dog’s ears is close time together. You can use this time to build stronger trust between you and your dog. Third, you save money instead of making an appointment and getting the veterinarian or groomer to do it. Fourth, you save time. It takes time and planning to get your dog to the vet or groomer. This needs to be planned in advance and sometimes appointments need to be changed. By learning how to clean dog ears at home you can do it at a time that is convenient for you and at a time that is relaxing for your dog. Fifth, your dog is more comfortable with you doing the ear cleaning. For most dogs, they are more relaxed when you clean their ears at home. Your dog is in the home environment where they feel safe and secure. If you can avoid a vet visit and learn how to clean dog ears at home then this is usually a happier experience for you and your dog. You can start by learning how to tell if your dog’s ears need cleaning or not. Then, you need to know how to clean them. When Should I Clean My Dog’s Ears? There are a few ways you can tell if your dog’s ears are dirty. The first way might sound strange, but it’s by smell. If your dog’s ears are healthy, they will have no odor at all. However, if they’re dirty, you’ll notice they smell bad. Another way you can tell is by color. If the dog’s ears are whatever color they normally should be, then they’re probably fine. But if you see that they’re red, that means they’re ready to be cleaned. Of course, if your dog has an ear infection then these symptoms could be the first sign of it. However, if there’s an infection the smell and red color will usually be accompanied by your dog scratching at the ears or rubbing them on the ground because they will be irritating or painful. There may also be discharge or swelling of the ear. If your dog has got to this stage of having an ear infection you need to make an appointment with your veterinarian to get it seen straight away. Dog Ear Cleaning – Never Do This! When you learn how to clean dog ears, it’s more important to know what not to do. When cleaning your dog’s ears, there are a few products that should never be used. For example, you should never use pure alcohol to try and disinfect their ears, because that may dry out the sensitive skin inside the ears too much. These nitrile gloves are latex-free and nitrile is 3x stronger than latex. They are also more comfortable than wearing vinyl gloves. CLICK HERE for the price. Also never use Q-tips or similar cotton tipped sticks, because that will only push dirt and debris farther down into the ear. You should use a cotton ball, wipes or gauze wrapped around your finger to clean the ear. You can use disposable gloves while you’re cleaning your dog’s ears. If you don’t like gloves then it’s fine to wash your hands thoroughly before and after doing the ear cleaning. As long as you keep everything hygienic you and your dog will be fine. Beware, if your dog has an allergy to latex which is found in certain disposable gloves make sure you get the ones that are suitable and won’t cause an allergic reaction. This dog ear cleaner is made in the USA. It has a soothing cucumber melon scent. CLICK HERE to see the current price. To learn how to clean dog ears you need to start with a good dog ear cleaner. Different cleaners make different claims about getting rid of ear mites, being soothing, being veterinarian formulated etc. They also have different scents. Some dogs don’t like a particular scent. If you try one dog cleaner and you think your dog doesn’t like it due to its smell it’s worth changing brands to test another one. It is easy to choose a different scent of ear cleaner and sometimes this makes a big difference to your dog’s co-operation. Once you’ve got everything together you want to start by taking some dog ear cleaning solution and apply it inside their ears. You can usually just squirt the solution into the ear easily, straight from the bottle. Now, at this stage, stop your dog from shaking it out. Then, massage the base of their ears for about half a minute. Once you’ve massaged the ear cleaner in, let your dog shake the solution out. Dogs naturally want to shake the ear cleaner out of their ears so they do it without any problem. Just be ready for it if you want to stand clear. Now you can use your cotton balls to clean up the inside of their ears. Access the inside of the ear by lifting the outside ear if necessary. Wipe in all the folds of the ears. Be careful not to go too deep into the ear canal. You don’t want to go inside it. You want to avoid pushing any dirt or debris further into the ear and you don’t want to use anything like a Q-tip which could go too far and damage the inside of the ear. If you have a puppy you’ll want to learn how to clean dog ears while your dog is still young. Puppies are often hesitant to let you clean their ears. Several days prior to ear cleaning, start conditioning them to have their ears touched. Coax your puppy into letting you touch their ears by giving them treats and petting them around the ears. They will eventually be comfortable with you touching their ears and allow you to clean them. You use the same method for cleaning a puppy’s ears as you would do for an adult dog’s ears. You should give your puppy a treat once you’re done, so they’ll be excited to have their ears cleaned again next time. Continue treating them as normal when they’re more grown up, but be gentler with an older dog, and treat them more often. 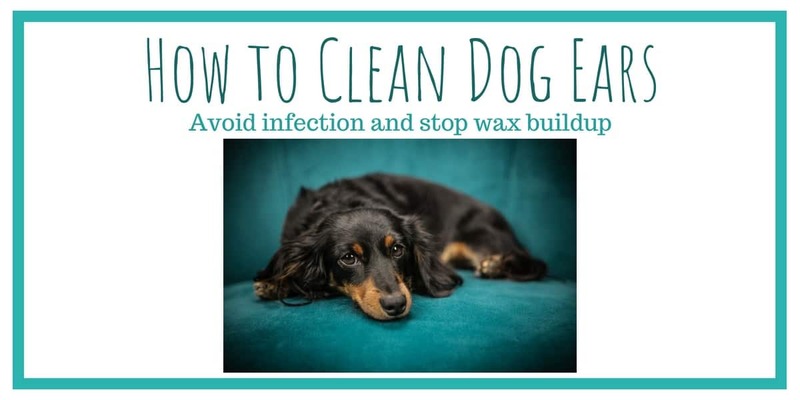 There are so many advantages if your learn how to clean dog ears but if your dog is reluctant to co-operate in the whole ear cleaning process you’ll need to do it more regularly. This makes it a normal experience. Be gentle and use lots of treats and you should be able to use the time you spend on ear cleaning as a bonding experience with your dog. ⇒ Need to remove matted fur? Find out how, Click Here. ⇒ Worried about your dog choking? Time to get a slow feed bowl. See more here. ⇒ Clipping black toe nails on a dog can be tricky. Find out how to do it at home here. This entry was posted in Dog Health on July 25, 2018 by Didi.